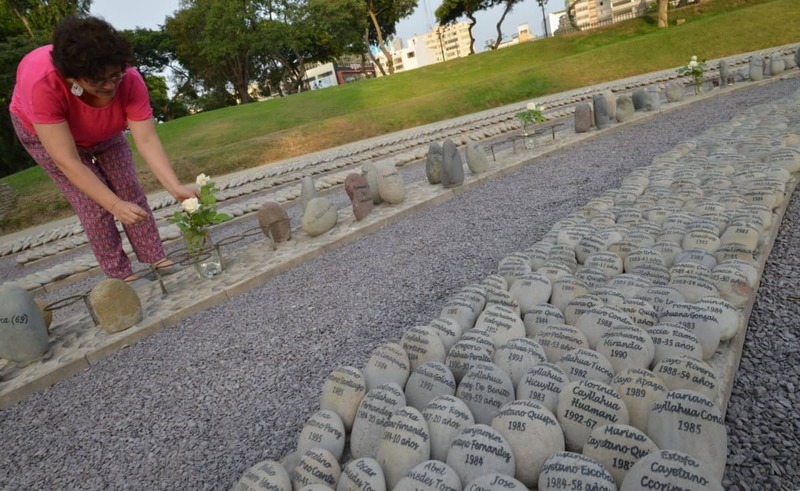 A relative of a victim of the regime of former Peruvian President (1990-2000) Alberto Fujimori places flowers at the Eye That Cries Monument in Lima on Feb. 2, 2018, to demand the annulment of a humanitarian pardon granted to him by Peruvian President Pedro Pablo Kuczynski. Victims’ families turned out in both Peru and Costa Rica to show their support for a request that the Inter-American Court on Human Rights, housed in San José, Costa Rica, review the pardon for Fujimori, who was serving a 25-year sentence. A hearing was held at the court headquarters yesterday regarding the request.